Wealth Management Advisor Kevin R. Earnest CLU® and his team provide clients with comprehensive financial expertise serving as a trusted advisor. They understand complex financial issues, and how they can affect life goals — whether a client is working to achieve current financial success, or protect and preserve assets over the long term. The mission of the team is to guide clients to personal definitions of financial security through attentive service. They will use a unique and disciplined values-based approach to help you make wise choices and to help ensure that your plan is structured around your goals and aspirations. The first phase is to lead clients to think clearly about the goal. Through open dialogue, asking questions, and listening attentively this is where clarity is achieved around creating a written financial plan that aligns aspirations with intentions. The second phase is to educate on macro level planning projections, provide context on current tracking to stated goal, begin to discuss solutions, and make decisions regarding closing the planning gaps. The third phase is to collaborate on implementation of the solutions and help achieve your desired results. This includes a comprehensive overview of all facets of a financial plan and coordination with a team of planning professionals to move towards achievement of the goal. The final phase is to inspire clients to engage our team and adhere to a proactive results management process. This ensures you have confidence your plan will work over time and meet your definition of financial security inspiring you to spend your life living. Working with a knowledgeable and experienced planning team that has access to current technologies and financial planning techniques is important. Working with an advisor who takes the time to understand your unique desires and goals is critical. 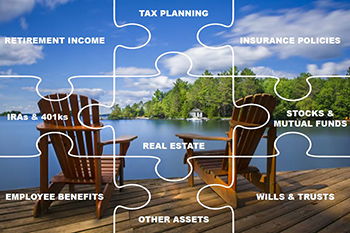 Kevin Earnest and his team will take the time to help you make that assessment, develop a plan that works for you, and provide you with the tools and strategies necessary to help assemble your financial puzzle. Review this site to learn more about Kevin Earnest and then feel free to contact him to help you ensure your financial future is all you want it to be. Northwestern Mutual is the marketing name for The Northwestern Mutual Life Insurance Company, Milwaukee, WI (NM) (life and disability insurance, annuities, and life insurance with long-term care benefits) and its subsidiaries. Kevin Ray Earnest is a Representative of Northwestern Mutual Wealth Management Company® (NMWMC), Milwaukee, WI (fiduciary and fee-based financial planning services), a subsidiary of NM, and federal savings bank. All NMWMC products and services are offered only by properly credentialed Representatives who operate from agency offices of NMWMC. Representative is an Insurance Agent of NM and Northwestern Long Term Care Insurance Company, Milwaukee, WI, (long-term care insurance) a subsidiary of NM, and a Registered Representative of Northwestern Mutual Investment Services, LLC (NMIS) (securities), a subsidiary of NM, broker-dealer, registered investment adviser and member FINRA (www.finra.org) and SIPC (www.sipc.org). Kevin Ray Earnest is primarily licensed in Illinois and may be licensed in other states.